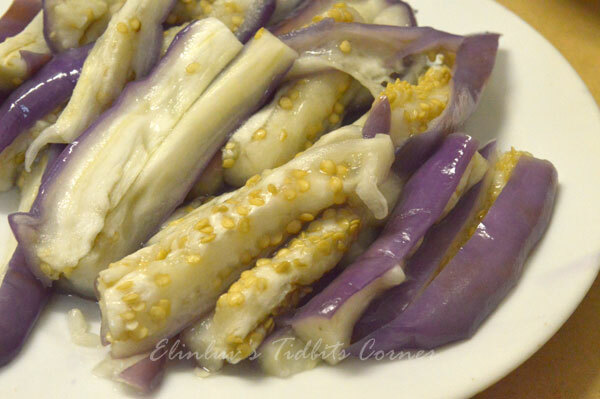 Saw this simple to whip out egg plant salad/side dish on Maangchi website and how could I not make it as I was drooling all the way reading through the ingredients for making this mouthwatering side dish. 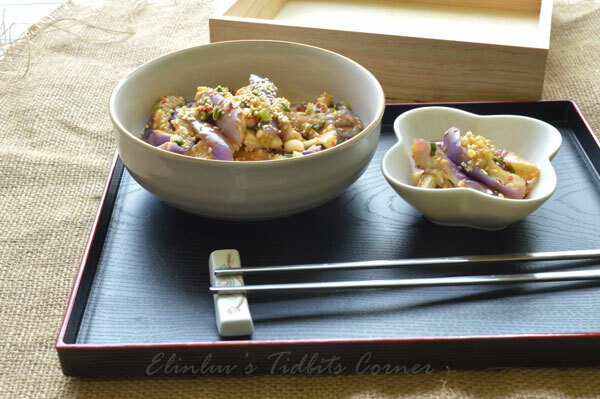 Gaji-namul is a everyday Korean side dish, meant to be eaten with other side dishes and rice. 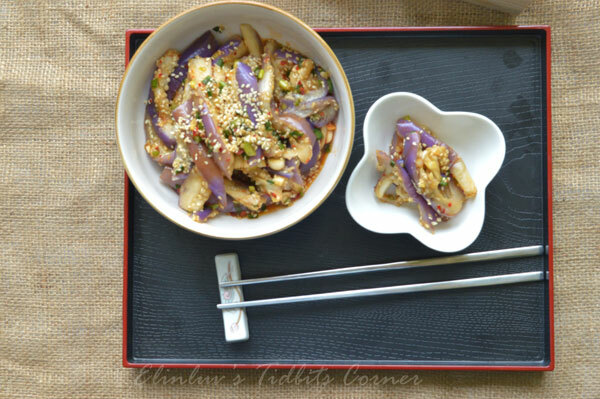 I made this eggplant dish using organic eggplant. My neighbor will pass one over to me one each time she harvest hers and it came in handy for making side dishes :) Thank you Su-Peng for sharing your organic edibles with me. Prep your steamer by adding 2 cups of water to it. Set heat to medium-high for it to boil, it shoud take about 5 minutes. Meanwhile, cut eggplants crosswise into 2½ inch pieces. Cut the thicker pieces in half lengthwise. When the water starts boiling, put the eggplants on the steamer rack and cover. Steam for 5 minutes over medium high heat. Remove from the heat. Take out the steamed eggplant and transfer to a cutting board. Let cool for 5 to 10 minutes until you can easily handle them. Tear each piece into bite size pieces. 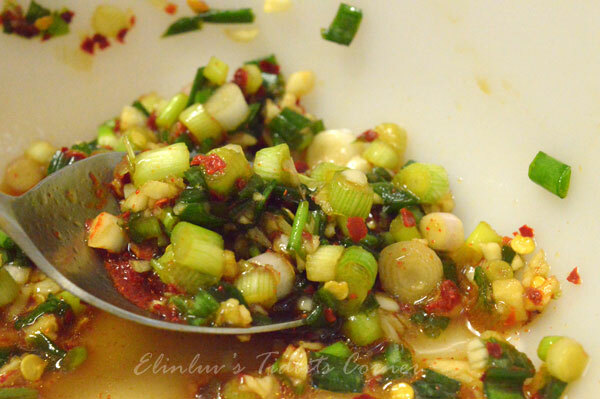 Combine garlic, green onion, soy sauce, fish sauce, hot pepper flakes, sesame oil in a mixing bowl. 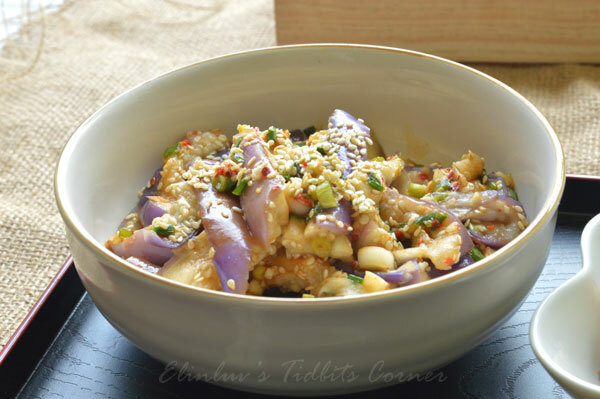 Add the steamed eggplant to the bowl and mix well by hand or with the wooden spoon. Sprinkle with the crushed sesame seeds and serve with rice. yummy .... home grown ka? So very appetizing and delicious, Elin.